aaw1976 That street harassment is real @Imjdan. It happens to young girls everyday and they can be assaulted if they speak up. abby_go_lucky walk down the street sans fear of harassment/degradation. can someone make that into a pithy protest slogan?! preferably one that rhymes! wandofmirkwood How dare Westerners call the veil oppressive when I can’t even go out in public without getting harassed? sarahsosiak Resolved: My new response to street-harassment will be an academic lecture about the economics of male attention. sarahsosiak Wow. It is way too early to need to come up with snappy comebacks to street harassment. gallifreychic went for a short run down terrigal and can’t even escape the creepy white racist pricks who when sighting an asian, catcall “nihao” at you. sophwarnes I’d almost forgotten about the time I saw a guy wanking on the bus in front of me. #SexualHarassment Made me feel sick. iHollaback Just got off the phone with an awesome girl who wrote an electropop song about street harassment. Music video time! Have an iPhone? Download a new Hollaback iPhone app that lets you report street harassers! ArriannaMarie I had to stop hunching & wearing sacks b/c I feared street harassment. I had to end all harmful relationships w/ male friends. SpookSquad GFY to dudes yelling at me from the protection of your house balcony as I walk. 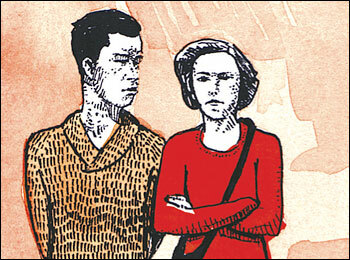 Ahhh,its like they say, #StreetHarassment begins at home. carolynlb Gosh, i love it when i get street harassment as I walk to the building RIGHT NEXT TO MY OFFICE. You are currently browsing the archives for the weekly round up category.